Don’t kid yourself. Labor can still mess this up. There is a complacency that has settled across the land: that this is in the bag for Labor. That won't end well. Labor's dividend imputation refundability reform could kick off an out-and-out brawl between a major political party and an interest group that is used to getting everything it wants. In a speech to the Asia Society, Chris Bowen has delivered an honest and forthright assessment of where we stand right now with our nearest and most important neighbours. It's the sort of error public servants dread -- a howler that goes right through them all and into a high-profile bill. And the best and the brightest of the Public Service did it to their Treasurer. 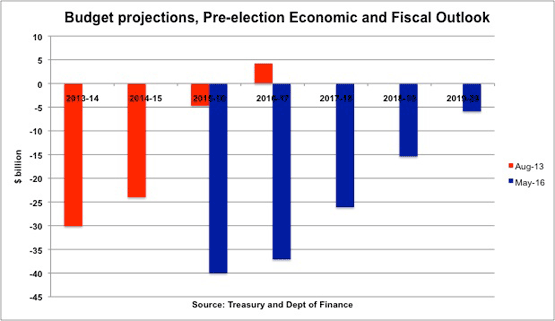 Labor has offered a 10-year budget projection for its election costings. But we can't even get the next three years right. Candidates in safe seats have it tough. Chris Bowen and Scott Morrison went head-to-head today but the exchanges focused primarily on the budget, not the wider economy. Chris Bowen delivered the usual shadow treasurer's budget reply today -- unusually, at the start of an election campaign and, unusually, with an extensive array of policies already laid out.